If contestants in TV’s Pointless quiz game were asked to name a Hybrid car and answered with Toyota Prius, then I am sure they would be onto a loser though booming sales of the model mean that Toyota have a big winner! Admittedly the first Prius Hybrid model did not strike me as a very pretty looking car, though its performance advantages were easily identifiable. Subsequent models of the five-seat hatch back certainly looked a bit better on the eye. Come Summer 2012 and the arrival of the Toyota Prius+ not only compounded the case for Toyota’s Hybrid technology but, in my opinion, re-wrote the road ahead for the MPV people carrier class of car. In fact, as Toyota has sometimes used the ‘+’ sign to signify an uplift in equipment/specification it took me a short time to appreciate that the model sitting ready for testing on my drive was actually a lot more than I anticipated…and not just for its kit. First experience revealed a commanding looking stylish hatchback, a little more experience and I realised that this was an occasional seven-seat people carrier, the like as yet I have to encounter. This Prius does not look like your average people mover, a generously proportioned sporty hatch back – yes. That Toyota claim that it has an average fuel consumption of 68.9 mpg and a carbon footprint of a tax saving 96 g/km are strong arguments in its favour. Developed from the mechanicals of the much applauded regular Prius, Toyota claim that it is the world’s first full hybrid seven-seat vehicle (though the two rear fold-flat seats could have a paucity of leg room depending on how the slide adjustment is employed on the second row seating). It employs a highly efficient 1.8 litre variable valve technology petrol engine working in conjunction with an electric motor and employing for the first time in a non-plug in hybrid, a lithium-ion battery. Total power output is 134 bhp, 98 bhp of which is from the main power unit. The battery power is fuelled by an energy recovery system when slowing down or under braking. The gearbox is an electrically assisted CVT (Constant Velocity Transmission) unit offering the right ratios in the seamless manner that is the hallmark of this type of system. A foot operated park brake might seem daunting to some drivers, though never fear, there is a hill hold system that ensures easy getaways even on challenging inclines. This car starts off in a silent manner on electric power and the petrol unit cuts in if there is a demand for more power, say on a slope or when speed has built up to close on 20 mph. When stationary both power units are at rest, consuming no fuel, obviously some battery power if air conditioning, audio and other electrical accessories are in use and then, if in a traffic crawl the car will creep along in a silent manner. As with any car, it is how you drive it that results in what you achieve when it comes to fuel consumption. Optimising a Hybrid like this requires a much more sensitive throttle foot, feathering the pedal without easing off speed and watching the economy meter record a lower fuel flow, electricity being generated and the bonus less brake wear…that’s money you are saving. As with any car, particularly one capable of carrying either seven passengers or a number of load permutations up to an occasional van capacity, the performance and fuel consumption can considerably vary but, for example, carrying a couple of adults, the claimed top speed of 103 mph and 0 to 62 mph (100 kph) from rest appears achievable and passable when stacked up against other seven-seat contenders. From the driver’s point of view the lifestyle is to a high standard, the seat is of good size and well contoured to provide comfortable location with plenty of scope for adjustment using a powered system and the adjustable steering column and comfortable pedal positioning ensures a relaxed yet ‘with it’ drive. Driver vision is very good with the rear view aided by a camera showing clearly defined images, day or night. A panoramic glass roof with a shade panel imparts a comfortable openness to the interior. display on the windscreen) and, above all, styled and finished to premium brand levels. I have heard all sorts of derogatory remarks about Hybrid cars, ranging from suggesting that they are a bit sissy, that they are not a serious proposition, that they have no driver appeal and that they are a passing phase. Don’t you believe it, this unique vehicle is an easy driving car with light yet responsive controls, a good comfortable and stable ride that handles more than competently considering what it is. Stability at motorway conditions is a tribute to the excellent aerodynamics of the body styling. Perhaps a discerning driver might want a bit more feel through the wheel…if so they should look at one of the more sporty cars in Toyota’s line-up as this one is for a more defined market which should be of sufficient magnitude to more than justify its existence. Having reported that there is more to this car than meets the eye, a check on the specification indicates a value for money package. For example there are bags of airbags including Toyota’s pioneering driver’s knee air bag, anti-whip lash front head rests, ISOFIX child seating systems, rain sensing wipers, cruise control, satellite navigation with voice command recognition/Google search connectivity, USB port, LED daytime running lights, heated manual fold exterior mirrors and much more. 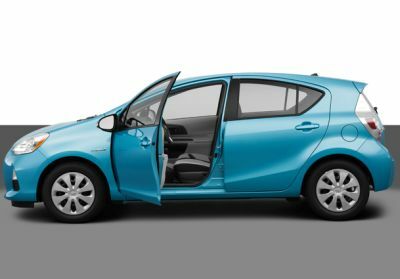 Consider Toyota’s high reliability record plus a five-year warranty that accompanies the Toyota Prius+ and I think it sets out a strong case. I would suggest it is ahead of the game, not a passing phase, rather a very strong pointer to the future. MAIN RIVALS: Volkswagen Sharan 1.4 TSI Blue Motion, SEAT Alhambra 2.0 TDI Ecomotive, Vauxhall Zafira 1.7 CDI Ecoflex.. Car manufacturing rose 17.4% in October marking the largest monthly increase so far this year, pushing the total cars built to 1,286,287 for the year-to-date, a rise of 5.4%. Commercial vehicle production was a mixed picture. October output declined 33.8% with the year-to-date down 19.9%. Bus and truck manufacturing is a bright spot, but overall the outlook remains gloomy for the rest of the year. Someone should get the organisations which represent motor show organisers and those acting on behalf of manufacturers together and lock them in a room until they sort themselves out. How ludicrous that there were international shows in Tokyo and Los Angeles taking place on the same day (once time differences have been factored in) while a third local show went on in Guangzhou (China). It is probably hoping too much to get the Chinese to comply, and Tokyo happens only every two years while LA is an annual event, but if the two internationally listed exhibitions want to co-exist peacefully there needs to be some separation. Those who had the resources and personnel doubled up and did simultaneous introductions. Others had to pick and choose. 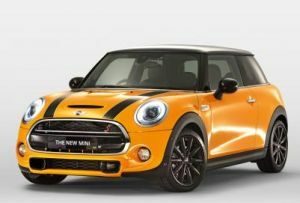 The heres, theres and everywheres included MINI with the third-generation hatch, Jaguar F-TYPE coupe and Porsche Macan. Unveiled at Oxford last week (Monday 18 November), and is instantly recognisable for what it is completely new from the ground up. Brand owner BMW says every component has been back to the drawing board in an effort to optimise its function, performance and style. The result is ‘The New Original', a MINI which is distinctly familiar but enhanced in every single way. It features significant improvements in technology, engine efficiency and power delivery, driving dynamics, quality and – of course – personalisation, it is claimed. Inside, the new MINI Hatch is quieter than the outgoing model, with improvements to acoustic refinement inside the cabin. The new MINI Hatch is more spacious than before, safer, finished to an even higher standard and provides the driver with a more dynamic and performance-oriented experience behind the wheel. The star of Los Angeles Auto Show was the all new Jaguar F-TYPE Coupé range building on the success of the 2013 drophead model. It has more room behind the driver for bits and pieces (two sets of golf clubs in the boot is claimed). The car is absolutely stunning. If you want to get away from the lights really quickly, the F-TYPE R, with its 550PS 5.0-litre supercharged V8 engine, offers acceleration from 0-60 mph in 4.0-seconds, and a top speed of 186 mph (limited). All models feature Jaguar's second-generation Electronic Active Differential which works in parallel with a new Torque Vectoring braking system to deliver enhanced agility and exploitable handling at the limit. Front engined drive is via the rear wheels through an eight-speed 'Quickshift' transmission with full manual sequential control via steering wheel-mounted paddles or the central SportShift lever. Differing mainly on engine specification prices start at £51,235 (3.0 Litre V6 340 Supercharged), with the “S” model £60,235 3.0 Litre V6 380 Supercharged) and the R type £85,000. 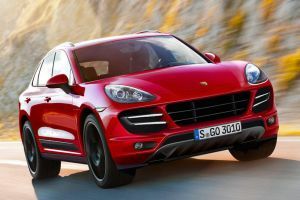 The Porsche Macan was the third new entry at Los Angeles. The compact SUV is a rival for the Range Rover Evoque with prices starting from £43,300. First customer deliveries are expected in April 2014.